To see a meteorite land would be pretty astonishing today (if anyone out there has, I’d love to hear about it) but imagine the effect it must have had on people living thousands of years ago. So perhaps we shouldn’t be surprised at a study suggesting the ancient Egyptians believed iron from meteorites had magical powers that could usher souls into the afterlife. 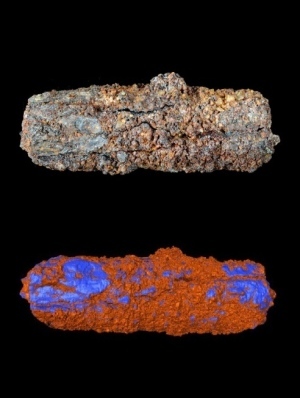 As I reported for Nature News yesterday, scientists including Diane Johnson at the Open University in Milton Keynes, and Joyce Tyldesley at the University of Manchester, carried out scanning electron microscopy and computed tomography analysis on a 5,000-year-old iron bead found in a grave at Gerzeh, 70 km south of Cairo, and found that the metal was of meteoritic origin. The bead was loaned by the Manchester Museum. It dates from prehistoric times, around 3,300 BC, and along with 8 others found in the same cemetery, it’s the oldest known iron artifact from Egypt. There’s no evidence of iron smelting in the region until thousands of years later – at least the 6th century BC, so the study settles an argument over where the metal came from. But I’m most fascinated by what meaning meteoritic iron might have held for the ancient Egyptians, and whether it had an influence on the development of their religion. There are only a handful of iron objects known from Egypt that date from before the 6th century. 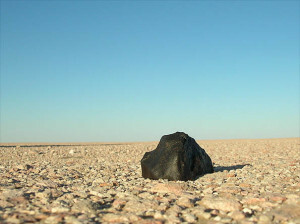 Several of them have a high nickel content, suggesting that they might also come from meteorites (although a detailed analysis like the current study would be needed to confirm this, as they could be the result of accidental early smelting efforts). Others may have been imported from countries that started smelting iron earlier. These artefacts seem to have been highly prized and of great religious significance: they are only found in pride of place in high-status tombs such as that of King Tutankhamun, who set off for the afterlife accompanied by a series of iron blades and amulets. The Egyptians loved rare, exotic materials. Other objects found at the Gerzeh cemetery include obsidian, ivory, and shells from the Red Sea and Mediterranean. But the association with meteorites may have rendered iron particularly significant. To the Egyptians, the sky was divine, so anything that fell from it would have been seen as a gift from the gods – if not a physical piece of one. They believed that the gods (as well as having flesh of gold and hair of lapis lazuli) had bones made of iron – a belief that may have been inspired by meteorite impacts. Interestingly, a new term for iron, biA-n-pt, became widespread at the end of the 18th Dynasty (around 1300 BC), just after King Tutankhamun’s time. It literally means “iron from the sky”. The authors of the latest paper suggest that it too could have been inspired by a major meteorite impact or shower. One possibility is the meteorite that formed the 45-metre diameter Gebel Kamil crater in southern Egypt, an impact that occurred sometime in the last 5,000 years. Other evidence that meteorites were particularly significant for the ancient Egyptians comes from the cult worship of stones that may have been of celestial origin. A prime example is the Benben stone of Heliopolis. It is thought to have been shaped like a mound or pyramid, and was displayed on top of a tall pillar in a temple dedicated to the Sun. One theory for why it was seen as so important is that it had fallen as a meteorite. Unfortunately the stone was lost in antiquity, so we’ll never know for sure.